A few days ago I had the pleasure of cooking a meal for a beautiful brand new family. Josh and Rhonda welcomed their little boy into the world just before Christmas. Although Lucas quickly established himself as an easy-going baby, he has one small foible. He is fussy about onions and garlic. The moment his mamma partakes of any dish containing these aromatics, he becomes vociferous in his discontent. I thought of this as I stirred pale slivers of leek into shimmering oil. How strange is is that a newborn baby can taste so much through his mother’s milk. What else could his new taste buds detect? First it must be that proverbial sweetness, warm and plump, coating the palate like crème brûlée. Then perhaps a flicker of bitterness from the hearty greens of mom’s dinner last night, a creamy soupçon of a morning avocado, and the umami-ripe depth of a lunchtime tomato soup. Of course it was only his mama and papa who ate my risotto, but I like to think that little Lucas got a vicarious taste of smoked salmon laced with lemon and herbs. And just the faintest whisper of white vermouth. 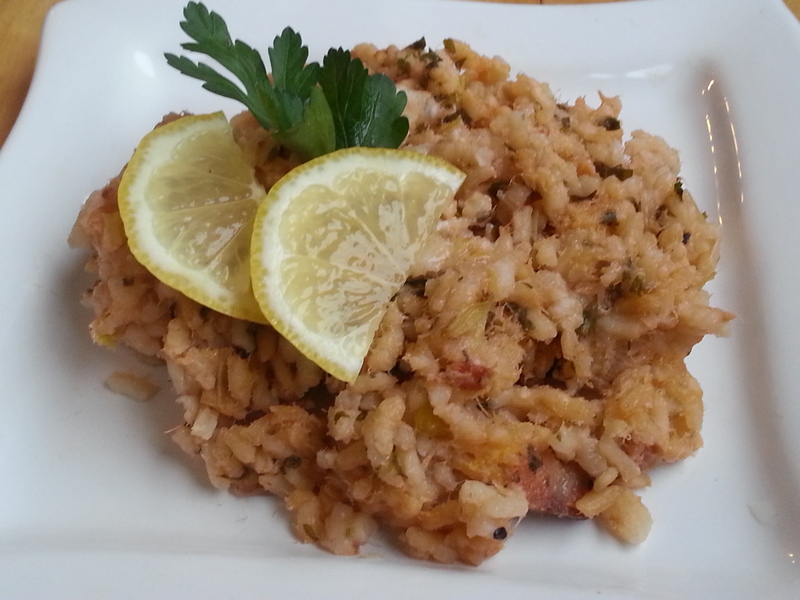 Hot smoked salmon works beautifully in this risotto, rich and woodsy against bright lemon. White vermouth replaces the usual wine, suffusing a panoply of herbal flavors into the dish. Heat the stock in a saucepan and then keep warm over a low heat on a back burner. Wash and finely chop the leek. Heat a large skillet over a medium-low heat and coat with olive oil. Sweat the leek until tender, about 5 minutes. Add the rice and stir to coat with oil. Add the vermouth and stir until liquid is absorbed. Add half the parsley, and a little stock. Stir until liquid is almost absorbed. Stir in the lemon zest and a splash more stock. Continue stirring, adding liquid as it is absorbed, until rice is almost ready but still has a bite to it, about 12-15 minutes. Stir in the salmon and a squeeze of lemon juice. Continue gently stirring until rice is tender. Season to taste with more lemon juice, salt, and pepper. Garnish with remaining parsley and shaved parmesan if desired.